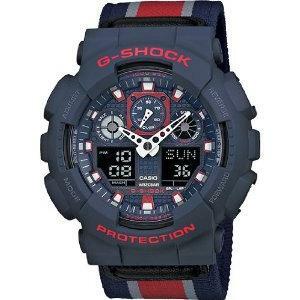 When it comes to military inspired watches, I have to say that G-Shock still owes their fans some explanation. No, it is not due to the lack of toughness that one who is in the army camp would yell about. It is the lack of style or options that G-Shock is offering to one of their biggest fanbase – the men and women in military uniform! The unveiling of military cloth band models will be a delight to folks who are looking for alternatives other than stainless steel or resin type of materials. I know stainless steel is great and classy, but when you are in a camp, no one gives a damn about such classiness. Then there is the resin band option. Casio had done a good job in formulating a highly durable strap but some simply dislikes its appearance. I believe the G-Shock military cloth band should fill this gap. It is a common knowledge that nylon-type of materials have been used widely in many aspects of the military – from bag to parachutes – and the latest unveiling is what many tough watch lovers have been anticipating. What do you think of the latest salvo from G-Shock? 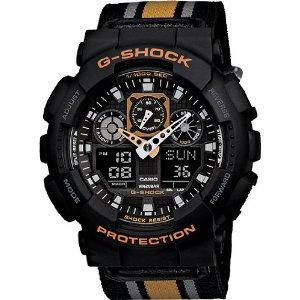 DOVER, NEW JERSEY, SEPTEMBER 24, 2013 — G-SHOCK has again combined rugged functionality and tough style with the latest addition to its ever-expanding range of technically fashionable timepieces: the GA100MC Military Cloth. By incorporating the raw durability of military stripped nylon webbing, an additional suggestion of adventure has been added to the iconic to GA100 series. 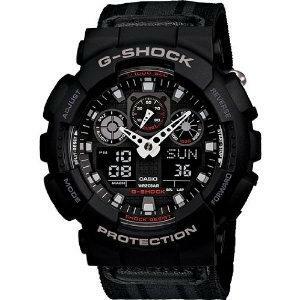 Built with G-SHOCK’s Magnetic Resist technology, this watch is resistant to the influence of magnetic fields encountered in modern life, resulting in minimal time deviation that would otherwise affect accuracy. Ideal for the “qualified self” or simply the inquisitive mind, the integrated Speed Indicator can calculate speed over a specified distance, showing readings on a digital display and analog sub-dial. Given the tendency to sleep late on those cool fall mornings, the G-SHOCK Military Cloth Band models come equipped with four independent daily alarms, as well as a snooze alarm to enjoy your lazy morning just a little longer. Adding a further degree of visual toughness, the military cloth band reinforces the rugged performance of the GA100 model itself. While the collection remains performance driven, the three color schemes allow the fashion-conscious to communicate a little personality: the more reserved black and gray GA100MC-1A, the confident charcoal and orange GA100MC-1A4, and the bold GA100MC-2A in navy and red. All models are 200M water resistant, shock resistant, employ a reverse LCD display, and feature, 48-city World Time, 1/1000th Sec. Stopwatch, Countdown timer , Auto LED light and of course, 12/24 hour formats for true military timekeeping. The GA100MC Military Cloth Band men’s watch collection will be available in September for $120 at select fashion boutiques, key jewelers, G-SHOCK NYC Soho store and on www.gshock.com.